Hey mid-Atlantic and Northeast friends! It’s pretty cold isn’t it? Dang. I’m not usually one to let weather affect me, or my plans. Of course this isn’t necessarily a good thing; there have been times I have been in slightly dangerous situations, and times when I have been quite physically uncomfortable. But a little rain? I’m still going to trek through Manhattan to try some diner I heard of, or walk the streets of Nashville in December with no umbrella. Snow is making it challenging to drive? I will walk to Trader Joe’s for groceries. I will say that I’m not nearly as hard-core as my dad, who went skiing the other day in -10 degrees Fahrenheit BEFORE windchill. Along with variations on food, I can be tempted by an interesting cocktail when I dine out. Recently, at a fairly upscale restaurant (Red Rooster Harlem) I paid $15 for a variation on a hot toddy that I actually could barely palate. It had some kind of spice that made me cough, along with all three of my dinner companions (of course I made them try it). Based on my experience, I can’t really recommend this place in general, but the only perspective I have is from arriving promptly when the restaurant opened for dinner without a reservation on a Saturday night. Guess what? I have all the ingredients to make my own variation on warm winter cocktail at home. 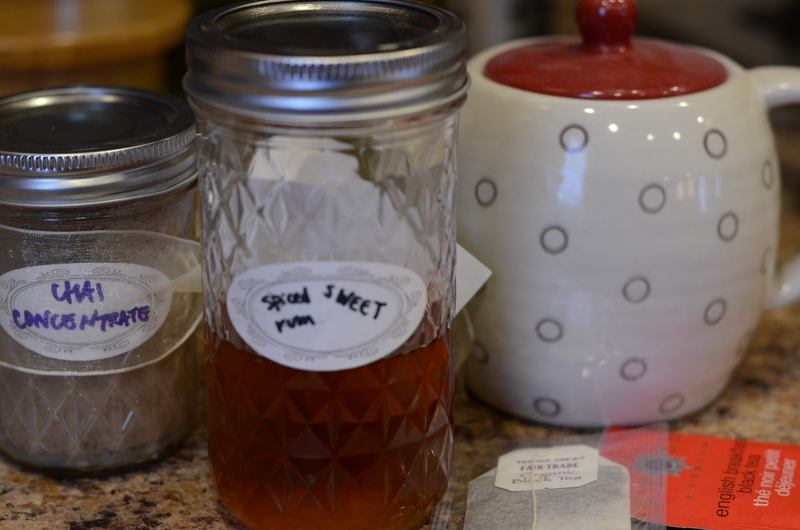 I incorporated not one but TWO homemade holiday gifts I had received: a spiced rum, and a chai tea concentrate. I realize that this means you’d have hard time replicating it, but I will include a suggestion that uses your own ingredients as a shortcut. 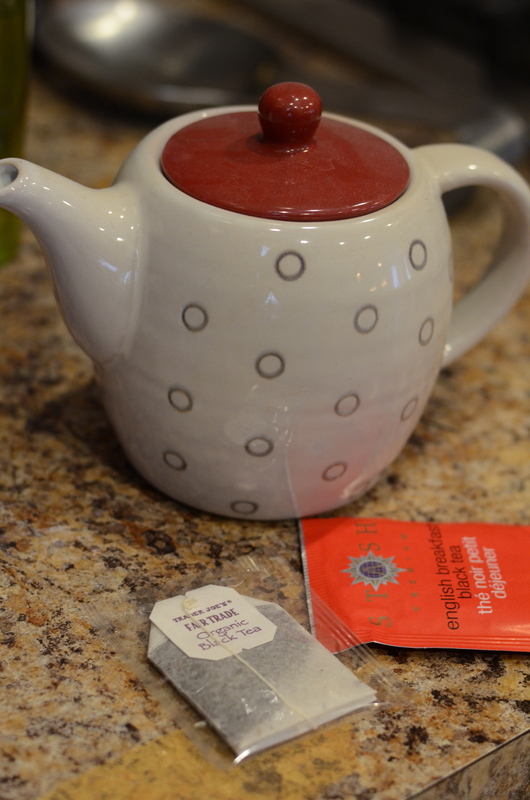 Pour hot water into a vessel to steep the 2 tea bags for 4 minutes. 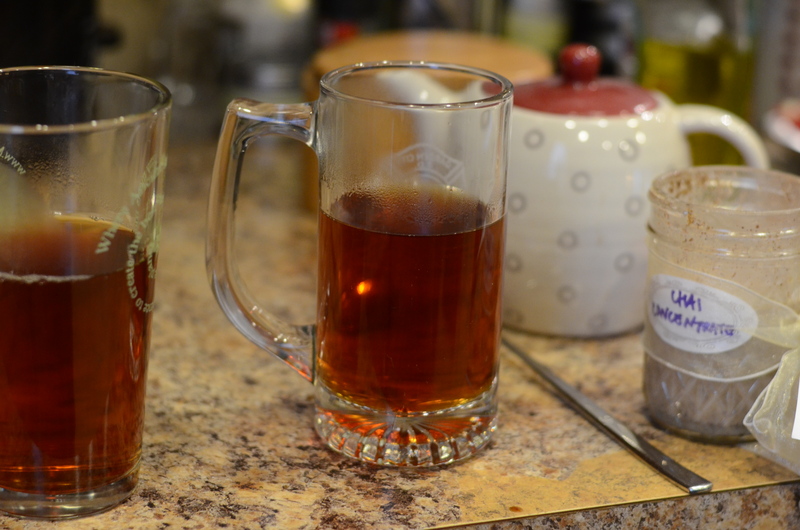 Pour tea into two serving glasses. 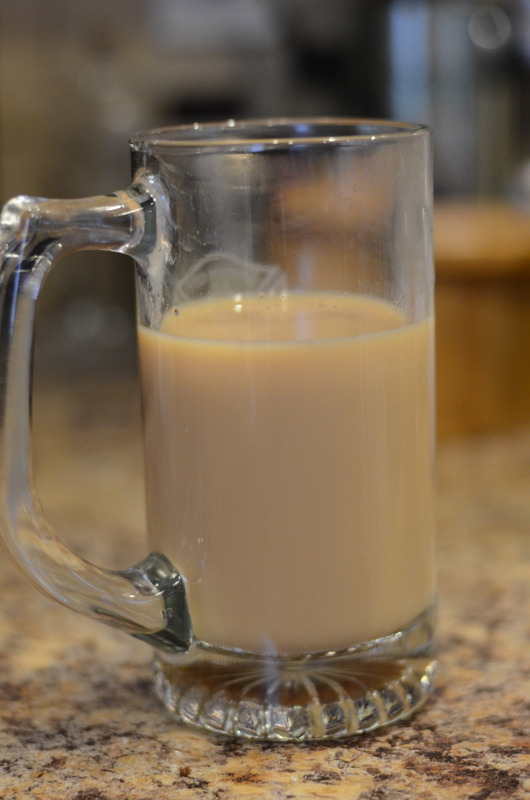 We have a ton of different types of drinking glasses, but darn, we don’t have an authentic glass mug for hot toddies! Measure about 1.5 ounces of rum and pour into each glass. Add a spoonful of chai tea concentrate and stir until combined. Drink immediately and feel warm and fuzzy. This entry was posted in Cocktails, Dessert, Entertaining, Fast and easy, Recipes and tagged chai, chai tea, cocktail, honey, hot toddy, rum, spiced rum, tea. Bookmark the permalink. That’s really disappointing that Red Rooster Harlem wasn’t great. I just read Marcus Samuelsson’s memoir (really good) and his restaurant sounded so interesting. Yeah, it was a bummer, but like I said, an experience in the dining room might be different. Good to know the book is worth a read!